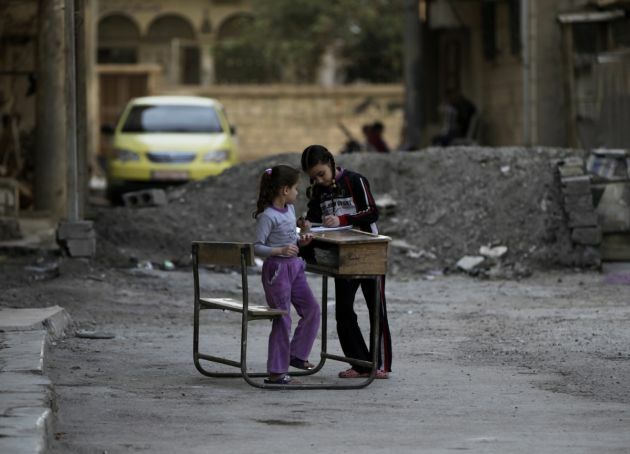 (Photo: REUTERS / Khalil Ashawi)Girls write on a school desk as they stand along a street in Deir al-Zor, eastern Syria, February 23, 2014. Picture taken February 23, 2014. AMMAN (Reuters) - Akram al-Bunni, a prominent leftist writer and former political prisoner, was abducted by Syrian intelligence agents as he left a wedding reception at a Damascus hotel on Saturday, opposition activists said. They said Bunni, who had previously spent two decades as a political prisoner, was snatched by agents from an intelligence division run by Hafez Makhlouf, a cousin of President Bashar al-Assad. His brother Anwar al-Bunni, a human rights lawyer who was also a political prisoner for five years, said Akram had riled the authorities by publicly supporting a democratic alternative to the four-decade rule of the Assad family. "This regime has not been satisfied that it stole 20 years of Akram's life and the effect that left on his health," Anwar al-Bunni told Reuters on Sunday from Damascus. "We are trying to get medicine to him. He has a heart condition." He said his brother, who is in his late 50s, had chosen to remain in Damascus despite the systematic persecution of dissidents since the uprising against al-Assad erupted with pro-democracy demonstrations in March 2011. Akram was among thousands of dissidents, opposition members and rebels whose name appeared on a Justice Ministry "terrorist list" that was leaked to an opposition news site two weeks ago, according to opposition sources. Those on the list, who include the opposition team who sat down this month with Assad's representatives at peace talks in Geneva, had their assets in Syria frozen. "I am not sure if Akram was taken because his name is on list. It is several months old," Bunni said. Activists and human rights organisation say tens of thousands of Syrians who peacefully protested against Assad have been arrested since the uprising began and the fate of many of them is unknown. "The regime is going around seeking local truces with armed groups while it arrests peaceful dissidents like Akram. Whom does it consider as its real enemy?" Anwar al-Bunni said, referring to recent ceasefires in and around Damascus. The Christian al-Bunni family is well known in Syria for its dogged opposition to the Assad family's rule. The four Bunni brothers, one sister and two of their spouses have spent 70 years among them as political prisoners. Akram al-Bunni spent a total of 20 years in prison under the rule of Assad and his late father, Hafez al-Assad, for his writings and political affiliations. Among others in detention is human rights lawyer Khalil Maatouk, also a Christian, and Mazen Darwish, who belongs to Assad's Alawite sect. Darwish was arrested in 2012 after helping to establish a centre to document victims of the crackdown by Assad's forces. The fate of another leading peaceful activist, veteran opposition figure Abdelaziz al-Khair, is unknown. He was abducted by secret police two years ago and was not heard from since, activists say.